The F1 champion has already been in talks with AMG to make it happen. 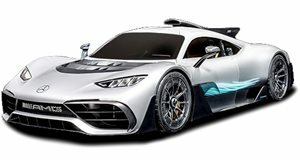 The Mercedes-AMG One will be one of the most technologically advanced and most powerful hypercars in the world when it launches next year. A 1.6-liter F1-sourced turbo V6 and electric motors combine to produce at least 1,000 horsepower, essentially making it an F1 car for the road. And yet F1 world champion Lewis Hamilton thinks the AMG One needs even more power. Speaking with Top Gear, Hamilton expressed his desire to help create a new "LH Edition” of the AMG One with even more power, more noise, and some styling tweaks. Remember, the F1 champion has been actively involved with the AMG One’s development and is the face of the car’s marketing campaign. The F1 champion added he would like to give the One LH Edition a louder exhaust system, "change a few of the surfaces,” and "add a little bit to the bodykit” to make the hypercar look more aggressive. He also suggested each special edition model could have a custom design for each buyer to add to the LH Edition's exclusivity. We’ll have to wait and see if Hamilton’s ideas get approved by AMG, but we wouldn’t be surprised considering his close relationship with the manufacturer.